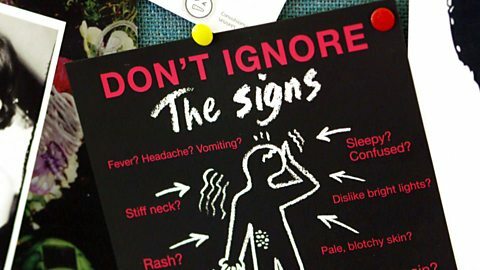 BBC Two - Trust Me, I'm a Doctor, Series 5, Episode 3 - How can I spot the signs of meningitis? Meningitis can come on suddenly and kill in hours, but spotting the symptoms quickly saves lives. Meningitis is an infection of the meninges – the protective membranes that surround the brain and the spinal cord. Whilst most of us have heard of it, it’s a disease that tends to generate a lot of confusion – not least because there are a number of different strains and causes. 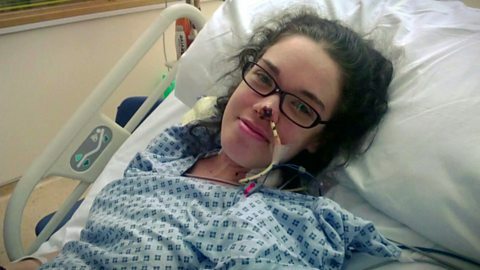 Viral meningitis (when the infection is caused by a virus) is the most common form of the disease but it’s also the least serious, and although it can make people very unwell, it’s rarely life-threatening. Bacterial meningitis, on the other hand, is very dangerous and can kill if it isn’t identified and treated quickly. It can be caused by a number of different kinds of bacteria, including several types of meningococcal bacteria which cause the strains known as Men A, B, C, W, X, Y and Z. These bacteria are also types that can cause sepsis (blood poisoning), and so sepsis can follow an initial bacterial meningitis infection as they spread further around the body. Meningitis can affect anyone, though it is most common in babies, children and teenagers. The elderly and those with weakened immune systems (such as people receiving chemotherapy) are also at increased risk. The viruses and bacteria that cause meningitis are spread from person to person through close physical contact like coughing, sneezing, kissing or sharing utensils and cutlery. Healthy people can carry the bacteria in their nose and throat without actually getting the disease, in fact most ‘carriers’ don’t actually get ill. The problem is that these ‘carriers’ can spread the bacteria to those who are more vulnerable to infection, like the very young and the very old. This is one of the reasons why students are such an important demographic in the spread of meningitis – they leave home and mix with lots of new people in environments where bacteria can easily spread. Then they return home where they can spread these bacteria to more vulnerable family members and friends. Most people have heard of the classic rash associated with meningitis that doesn’t disappear when you press a clear glass firmly against it. However it’s important to know that this is a late sign and is an indication that meningitis has led to sepsis, so if you’re worried about meningitis don’t wait until a rash appears to seek help. The rash typically starts off as small red pinpricks but these turn into red or purple coloured blotches as it spreads all over the body. It can be difficult to spot it on darker skin so keep an eye on the palms, the soles of the feet or other paler areas. If you see this rash you should seek urgent medical attention – it is a sign that sepsis has started and it can quickly be life-threatening. If you spot any of the other signs, you should call for medical help and describe them carefully, saying that you suspect meningitis or sepsis. If you have been reassured by a professional once but the symptoms worsen, call again. If you spot these symptoms you should seek medical advice immediately – and remember that not all of these signs will always be present. Men B is the most common cause of bacterial meningitis in the UK and peaks in babies of around 5-6 months of age. The Men B vaccination is currently recommended by the NHS for babies at 8 weeks, 16 weeks and one year. Up until July 2016 babies were offered a Men C vaccination at 12 weeks, but this programme has been so successful that the vaccination is no longer required and has been removed from the schedule. All children are still offered a Hib/Men C vaccination at age 1 and the Men ACWY vaccination is offered to teenagers. In recent years a deadly new strain of Men W has emerged, causing a spike of cases, particularly amongst young people. This new vaccine protects against Men W and three other causes of meningitis and sepsis and is currently being rolled out to target teenagers and students. In the future this vaccine will be offered to 14 year olds as part of the routine schools vaccination programme. Dr Saleyha Ahsan shows us how to spot meningitis and save lives. LSBU’s Prof Warren Turner explains why students should learn to spot meningitis. The signs we should ALL know to spot of this little-known killer.